In much the same way as the Celts had their tradition of the High Kings, so the Angles and Saxons, in the first couple of centuries after their eastern kingdoms had been formed, often recognised the overall authority and supremacy of one king over all the rest. Usually this was at a time at which that ruler's kingdom was at its strongest, and initial force of arms had demonstrated the ability of that ruler to claim the title of bretwalda or 'brytenwealda'. The second form of this word is probably the older. It originates in a Germanic concept of an over-king, literally meaning 'Britain ruler'. Another early form of the title is 'bretenanwealde', with the last part, 'anwealda' meaning 'sole ruler'. Bosworth and Toller show 'wealda' as meaning 'a ruler', citing variations in Old Saxon, Old High German, and Icelandic (a variation of Old Norse). They add that 'wealdan' means 'to have power over'. Only one bretwalda is mentioned in the Anglo-Saxon Chronicle, but Bede, writing a century and-a-half earlier than the ASC's compilation, supplies many of the missing names (although he leaves out the Mercian kings). Some others are not named bretwalda as such, but pretty much fulfilled the functions of the title in all but name (and it is possible that records were made after Bede's time and were later lost). These probable bretwaldas are shown in green text. Until Edwin of the Northumbrians took the title, the bretwaldas only counted the territory to the south of the Humber as being within their influence. The Deiran and Bernician Angles thought of themselves as being apart from the southerners, perhaps even more so when Edwin smashed North Rheged and greatly enlarged Northumbria. Also, it is highly possible, given that the Angle and Saxon kings would have known about the British tradition of a high kingship, that the assumption of the bretwalda title was a deliberate attempt not only at legitimising their own claims to land they had conquered, but to demonstrate to the Britons that they were now in charge and were the rightful successors to the Britons who had failed to defend their island. Linguistically, a great many place names in the newly-forming England preserved or applied the Latin -vici ending (for some reason Briton/Gaulish place names reverse the sequence from noun-modifier to modifier-noun). In proto-Celtic we have *wīko-, *wīku-, meaning a village, while Latin has 'vicus', also meaning village, Gaelic has 'fich', village again and not too dissimilar from the Latin form given several centuries of drift, Anglo-Saxon has 'wíc' as a 'dwelling-place, lodging, habitation, house, mansion', or as a village or town, while the plural form means 'entrenchments, camp, castle, fortress; street, lane; bay, creek'. This appears to have been extended to mean a market town or trading town. All of these languages share a common proto-Celtic/Celto-Ligurian base, but proto-Germanic seems to contain no similar word. It appears possible that 'wic' is another word that was borrowed from the Britons, either in its Latin or Brythonic form (which probably were nearly identical). Gothic does contain 'weihs', which seems to be cognate. But Goths also took over Gaulish territory, so who would be uncontaminated by cross-cultural influences? The various groups that made up the Scandinavians, probably. At first glance Old Norse seems to have no word like the Anglo-Saxon 'wic', and the nearest cognate appears to be 'byg∂' (byg-voiced 'th'), meaning a dwelling, and 'byggva', meaning 'to dwell'. But further investigation uncovers the intriguing possibility that the word was borrowed into Old Norse from its meaning of trading town, then modified with the -ing suffix to form the word 'viking', a trading voyage or trader. Most people think of a Viking as only a seaborne warrior but the truth is that these Norse sailors both raided and traded. This goes against the theory that the word is derive from 'vik', a 'creek or inlet'. A jump from a creek or inlet to an expedition or voyage by water makes less sense than going from trading town to a trading expedition to such a town. So the very existence of Vikings by that name seemingly is based on the Anglo-Saxon conquest of England. Tribes of Angles, Jutes and Saxons, along with mixtures of various other peoples, invade the eastern coast of Britain, pushing westwards along river valleys and quickly forging early kingdoms. A popular modern term for this is 'engla-tocyme', literally the 'coming of the English', although that term will not exist for several centuries after this date. All the tribes are speakers of the Anglo-Frisian group of Low German languages, using the same language with slight differences of dialect. Newly arrived Saxons under Ælle and his sons, Cymen, Wlencing, and Cissa, land at Cymens ora and beat off the Britons who oppose their landing (part of the proposed British territory of Rhegin), driving them to take refuge in the great forest called Andredesleag (The Weald). These Saxons quickly become known as the Suth Seaxe. King of the Suth Seaxe. Leader at Mons Badonicus in c.496? Clovis of the Franks defeats, captures and executes Syagrius, the last Roman commander of Soissons. The Franks are now completely dominant in northern Gaul and Roman control has been thrown off. The death of Syagrius also sends a signal to the Saxons and other Germanic peoples that attempting to settle in Gaul is now hopeless. This would seem to be the single defining event that forces the Saxons to turn their attention to invading Britain instead. This is a probable date for the siege of Mons Badonicus - at the very least it would seem to be the correct decade based on available evidence. Not mentioned in surviving Anglo-Saxon records, the most likely chain of events is that it is Ælle, as bretwalda, who leads the attack on the Britons in the region of Caer Baddan. Ælle's route is probably northwards towards the Thames Valley (the Weald would still be passable along one of the Roman roads, possibly the Sussex Greensand Way which may have been built to link several villas to Stane Street - the main Noviomagus-London road). There he builds up his forces from the large numbers of Saxons there (along with a probable force from Kent), and then heads westwards along the upper Thames Valley until he emerges through the Goring Gap. It seems creditable to assume that the north-facing Wansdyke, constructed in the fifth or sixth centuries, has been put up by British forces in Wiltshire in the face of just such a threat of Saxons breaking through from the Thames Valley. It may either have been constructed to ward off this very attack (and perhaps channel the attackers towards Badon), or in response to it, to ensure that no future attacks of this nature could take place. In that it is very effective, until the West Seaxe break through in 577. There is now a gap in bretwaldas between the start of the sixth century and the rise of Ceawlin in the middle of the century. This is probably due to the Mons Badonicus defeat and the long peace between the Britons and the Germanic coastal settlements. As there is no significant warfare, there can be no significantly superior war leader to push forward the Germanic advance. Quite the opposite, in fact, as there seems to be a reverse migration of Angles and Saxons into the Continent during the first half of the sixth century. Those that remain are firmly in control of the east (see feature link, right). The Old English poem Widsith mentions several minor Germanic peoples, not all of whom can be properly identified alongside the more obvious peoples such as the Angles, Austrasian Franks, Burgundians, Danes, Finns, Geats, Jutes, and Ostrogoths. Another great Old English Poem is Beowulf, which records events of this time in the Anglo-Saxon homelands in Denmark and southern Scandinavia. A prince of the Geat court, Beowulf visits Hrothgar Scylding at his hall of Heorot where he rids Hrothgar of the monster, Grendal. On the Continent, the Franks of Austrasia conquer the Thuringians. Portions of territory are lost to the Saxons, probably to the Continental Saxons, but there also seems to be a reverse migration of Germanics from the east coast of Britain, where the British victory at Mons Badonicus has cut them off from the acquisition of new lands. These returning Angles and Saxons appear to be given land in Thuringia by King Theuderich. However, it is also at this time, in this century, that the migration of Britons from the mainland to Brittany is at its heaviest, weakening the British defensive position for the future. 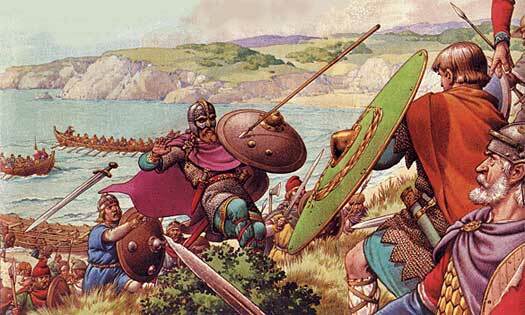 Ceawlin and his brother Cutha of the West Seaxe defeat Æthelbert of the Cantware at Wibbandun. This is notable as being the first recorded conflict between two groups of invaders, and a conflict between two rulers with ambitions greater than the rule of their own kingdoms. Ceawlin especially is looking to re-establish the title of bretwalda at this time, and perhaps this victory secures it for him, although 571 is another likely date for this. King of the West Seaxe. The Romano-British station at Viriconium in Pengwern is sacked, but Ceawlin's brother Cutha is killed in battle at nearby Fethanleag. Ceawlin takes 'many townships and countless spoil and returns in anger to his own', apparently giving up on the possibility of expanding the kingdom to the north. It also seems likely that this defeat marks the realistic end of his claims to the bretwaldaship, and possibly robs him of vital support within his own kingdom (with the death of Cutha). The Anglo-Saxon Chronicle is curiously silent about just when he loses the title, and the events surrounding it, but it seems that Æthelbert of the Cantware might be involved. The usurpation of Ceawlin of the West Seaxe gifts the bretwaldaship of southern England to Æthelbert of the Cantware, his only serious rival for the title - if he does not already have it, as suggested by the Anglo-Saxon Chronicle and its reference to Æthelbert being 'baptised' early in his reign, ie. about 588. 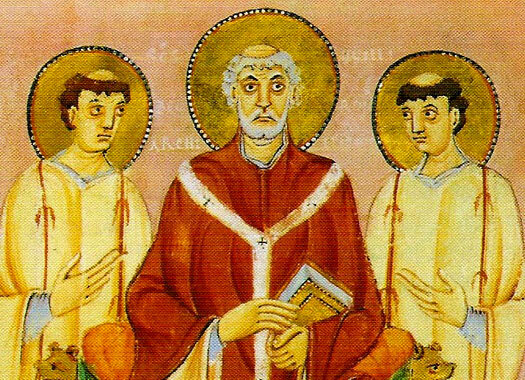 Augustine is sent by Pope Gregory to England to establish the Catholic church and Christianise the Anglo-Saxons. He is cautiously received in Kent, thanks to King Æthelbert's Christian wife (although there are signs that Æthelbert himself may have strongly suggested beforehand that the mission be sent), and establishes the archbishopric at Canterbury. The first meeting takes place between the Roman Church in the form of St Augustine of Canterbury, and the Celtic Church (the descendant of the former British Church of the Roman period). It is arranged by Æthelbert using the Hwicce as intermediaries and the meeting occurs at a place Bede names at St Augustine's Oak, on the border between the Hwicce territory and that of the West Seaxe. The meeting goes favourably for Augustine. A second meeting is quickly arranged, although perhaps not in the same year. This takes place at Abberley in Worcestershire, probably close to the border between the Hwicce and Pengwern, but ends in disappointment for the Roman envoy, with no agreements of cooperation or unity being reached between the two churches, especially in regard to the important question of the calculations for Easter and evangelising the pagan English. The failure is a blow for Æthelbert's prestige as bretwalda. King of the East Engle. Buried at Sutton Hoo. After seeking asylum at Rædwald's East Engle court since being forced to flee Deira by Æthelfrith of Bernicia, Edwin is able to regain his throne when Rædwald defeats Æthelfrith at the Battle of the River Idle. The battle confirms Rædwald as bretwalda, seemingly after Æthelfrith's defeat by Britons at the Battle of Bangor-is-Coed around 613 has weakened him. In turn, Edwin succeeds him as the first bretwalda north of the Humber. He never extends his bretwaldaship over Kent, treating it as a fellow kingdom and its king, Eadbald, as his peer. King of the Bernician & Deiran Northumbrians. King of the Bernician Northumbrians. Oswald of Bernicia & Deira is killed by Penda of Mercia on 5 August at the Battle of Maserfelth. The location of Maserfelth is still disputed but opinion favours Oswestry ('Oswald's tree') in Shropshire. Supreme power in England switches from the north to the Midlands. Penda of Mercia is killed in battle by Oswiu of Northumbria, and with this victory supreme power in England swings back to the north. Oswiu cements the increasingly accepted union of Deira with Bernicia to create a single kingdom of the Angles north of the Humber, known as Northumbria. Pope Sergius ordains Bishop Willibrord as the bishop of the Frisians. The bishop is a Northumbrian missionary and a follower of Bishop Wilfred, one of a wave of English Christians to enter Germanic lands in this period in order to bring them into the faith. Although all the Anglo-Saxon tribes which had originally invaded Britain had all been speakers of the Anglo-Frisian group of Low German languages, and had been speaking the same language with slight differences of dialect, by this century those dialects have diverged into four main groups: Northumbrian and Mercian (the Anglian group), and West Saxon and Kentish (the Southern group of Saxon and Jutish dialects). Thanks to the fact that the Angles have long been the dominant tribe, both in their pre-migration homelands and here in Britain, it is their name that comes to represent the Anglo-Saxon language and emerging nation, as 'Anglish' and Angle-land' respectively. In what is the first major attack by Vikings on English territory, Lindsfarne Monastery is sacked by raiders and the monks are slaughtered. The age of enlightenment and learning in Britain in which Lindisfarne had played a major role now begins a steep decline. The situation is not helped by the continuing dynastic discord in the kingdom of Northumbria. Ecgberht gains revenge for his father's death when he defeats the mighty Mercians at the Battle of Ellandon. He swiftly intercedes in Kent, sending his son, Æthulwulf, with a force to seize the key to the whole of the south-east. Kent, the oldest of the English kingdoms, with the most prestige and with great wealth, is also home to the primary see at Canterbury. The sub-kingdoms of Essex, Sussex and Suthrige submit to Ecgberht and are also ruled by Æthulwulf. From this point, Wessex remains the strongest of the Anglo-Saxon kingdoms. Athelstan of East Anglia kills Ludecan of Mercia in battle after yet another attempt by the once great Midland kings to restore that greatness. With this act, Athelstan secures the independence of the East Angles and establishes himself as king. Although he still acknowledges Ecgberht of Wessex as his overlord, his is the only one of the smaller English kingdoms not to be absorbed directly within Wessex. Ivarr the Boneless, king of Dublin, and his brothers, the sons of Ragnarr Lothbrok, lead the first Viking army to invade mainland Britain in search of conquest rather than pillage. 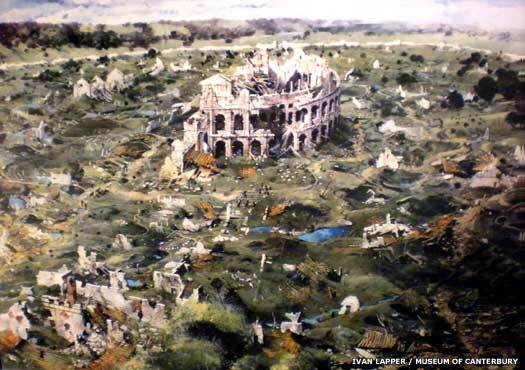 Landing in East Anglia, they ravage the kingdom for a year before heading into Northumbria in 866. That kingdom falls in 867 and a puppet king is installed. The Great Army moves south, campaigning during the spring and summer. East Anglia falls in 869, and the capital of Alt Clut is sacked in 870. Ynys Manau also falls to them in around 870, and between 870-871, Ivarr's brother, Bagsecg, is involved in the attacks, leading the Great Summer Army into England and adding his forces to those of Ivarr and Halfdan. 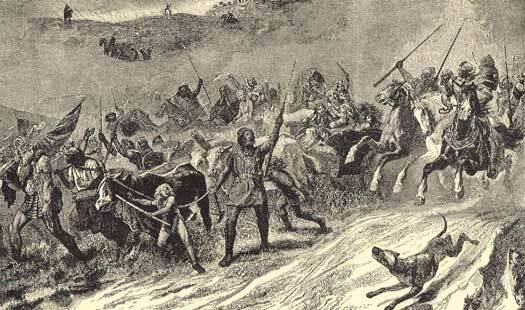 Bagsecg is killed at the Battle of Ashdown in Wessex in 871, and the following year the Great Army is back in Northumbria. It winters in late 872 and early 873 at Torksey on the River Trent in Lindsey, before moving west into Mercia, which is defeated in 874 and a vassal king is installed on its throne. Later that year the army divides, with one half going to Cambridge and the rest heading towards the Tyne and eventually settling in York. The Danes have overcome much of England, and Wessex is virtually the only independent survivor (along with the southwest of Mercia), achieving total dominance over all the English within less than a century. The West Saxon kings are titled 'Emperors of Britain' in the tenth century, which is probably a natural extension of the role and prestige of the bretwaldas.